Broad Momentum Decline: What Comes Next? Yesterday we saw that slow, narrow days lead to unfavorable expectations over the near term. Sure enough, today we saw a late drop today that could turn into a broad momentum decline tomorrow. A broad momentum decline, as I'm defining it, is one in which 500 or more stocks are displaying strong downward momentum as compared with upward momentum. Momentum is measured by a price close above or below a volatility band surrounding the stock's short-term moving average. All stocks in the NYSE and NASDAQ are included. When 500 or more stocks are closing below their envelopes than above, you have a large number of issues that are very weak in the near term. Since March, 2003 (N = 724), we have had 42 broad momentum decline days. Two days later in SPY, the market was down by an average of -.11% (16 up, 26 down). After declining market days that did not show broad market declines (N = 271), the market was up two days later by an average of .18% (158 up, 113 down). What this suggests is that markets that fall without broad momentum tend to reverse in the short run, but markets with broad momentum declines tend to continue their weakness near term. This strikes me as a pattern worth exploring over a variety of time frames. If tomorrow turns out to be a broad momentum decline, we'd expect greater near-term weakness thereafter than if selling tomorrow is more modest. Slow, Narrow Days: What Next? Monday was a very narrow range, slow day in SPY. Volume was approximately 60% of the 60-day average volume and the entire range for the day was only .36%. What tends to happen after such narrow, slow days? First off, it's interesting to note that SPY volume as a % of 60-day volume correlates .51 with the daily trading range. Monitoring SPY volume in real time is an excellent way of handicapping the likely volume for the day. Seeing that volumes were running well below the normal volume for the relevant period alerted one to take profits quickly and to expect a range bound trade. Since March, 2003 (N = 728), we've had 30 days in which the SPY range has been less than or equal to .50% and the volume has been 70% or less of the 60-day average. The average change three days later is -.43% (8 up, 22 down), much worse than the three-day average change of .19% (430 up, 298 down) for the sample overall. It appears that low volume and low volatility do not bode well for the bulls in the near term. The ratio of down to up occasions following the slow, narrow days is quite striking. This poster graces my office, thanks to Despair.com. Yesterday's entry found that there was greater follow through to the upside when rises in SPY were accompanied by an expansion in the number of stocks making fresh 20-day highs. Today we look at days in which SPY declines to see if the number of new lows makes a difference. Since January, 2003, we have had 334 declining days in SPY. When those declines have been accompanied by an increase in the number of stocks registering fresh 20-day lows (N = 249), the average gain in SPY over the next two days has been .08% (133 up, 116 down). When declines in SPY have not been accompanied by an expansion in new lows (N = 85), the next two days in SPY have averaged a gain of .25% (48 up, 37 down). When there is broad participation to the upside during market rises, there is usually room for further upside. When there is not broad participation to the downside during market declines, there tends to be reversal of the weakness. These are relationships that may well hold over other time frames as well. If you've followed the Trading Psychology Weblog, you know I place great emphasis upon whether or not rising markets expand the number of stocks making fresh short-term highs (and vice versa). Rises in ES that do not expand new highs and declines that do not expand new lows are, in my testing, more likely to reverse than rises and falls that are accompanied by broad participation across market sectors. Going back to January, 2003, I found 419 days in which the S&P 500 Index (SPY) was up on the day. Of these, 229 displayed an expansion in the number of NYSE, NASDAQ, and AMEX stocks making new 20 day highs. Three days later, SPY was up by an average of .20% (136 up, 93 down). When the rises in SPY were not accompanied by an expansion of 20 day highs, SPY over the next three days averaged a gain of only .02% (103 up, 87 down). It will be interesting to study this relationship over different time frames, intraday as well as longer term. In general, it appears that upside moves are more likely to continue higher if they carry a majority of issues to fresh new highs. When this doesn't happen, it suggests that many stock sectors are not participating in the rise, setting up subnormal near term returns. Yesterday's entry looked at occasions when small caps outperform large caps on the upside and found that such a scenario leads to short-term strength in the S&P, which indeed proved to be the case on Friday. Friday's rise, however, was notable in that the gain in the S&P (SPY) was almost twice the size of the gain in the Russell 2000 Index (IWM): .93% vs. .50%. I examined occasions in which SPY was up more than .50% on a one-day basis, and then broke down those occasions based upon the performance of IWM. In general, since January, 2003 (N = 771), there have been 202 days in which SPY has been up more than .50%. Two days later, SPY has averaged a loss of -.04% (96 up, 106 down)--weaker than the average two-day gain of .14% for the remainder of the sample (316 up, 253 down). This fits the pattern noted often in this blog: strength leads to near-term weakness and vice versa. When SPY is up by more than .50% in a single day and outperforms IWM (N = 66), the next three days average a loss of -.08% (29 up, 37 down). When IWM outperforms the strong SPY, the next three days average a gain of .14% (85 up, 51 down). It thus appears that underperformance by IWM worsens the subnormal returns that tend to follow strong market days. When IWM outperforms SPY, strength is more likely to lead to further strength. When SPY outperforms the small caps, strength is more likely to be reversed. Do Small Cap Stocks Lead the S&P? A couple of readers suggested that I take a look at what happens with the S&P market as a function of strength in the small cap (Russell) stocks, given the recent outperformance of those small caps. I recently sent off an article to the Trading Markets site that should appear Friday AM that will present one facet of this issue. In this analysis, I focus on markets since January, 2003 (N = 768) in which the Russell is up on a one, two, and three day basis, with the three-day gain exceeding 2% (N = 130). Three days later, the S&P is up by an average of .45% (87 up, 43 down), much stronger than the three-day average gain of .07% for the remainder of the sample (358 up, 280 down). A strong Russell, such as we've had lately, has led to near-term large cap stock strength. In this context, it does appear that small stocks do lead large ones during strong moves. This may be because small stocks tend to be more volatile and thus will outperform during bullish trending markets. How much territory does a market cover in a day? I decided to add up all the one minute ranges in ES from 11/1/05 - present (N = 57 days). It turns out that the average total movement of the ES per day is 217 points, with an average daily range of 9.9 points. Today, the market traveled a total of 304 points, the second highest total in the sample. The only higher day was Friday's big move down, which came in at 307 points. Friday's range, however, was 23.75 points--fully 10 more points than yesterday's range. Friday was a volatile trend day, but today was a volatile, non-trending day. Indeed, when we look at past days with an approximate 13 point range, the average number of points traveled is under 230--well below today's total. I could only find three days in the sample in which we had a somewhat similar configuration of a moderately wide range and very large movement within that range. All three led to a relatively non-volatile market the following day, with ranges below 10 points. This will bear further study. What we're seeing is that volatility--as defined by total range during a day is not the same as volatility defined as the total movement within that day. Although the two correlate highly--about .60--it means that only 36% of the variance in a day's range is accounted for by the size of minute-to-minute movement. High volatility range bound days may not have the same expectations as high volatility trend days, both with respect to directional follow through and carry over of volatility. My initial findings suggest that institutional participation is higher during the trend days, creating greater price and volatility persistence. I hope to post further results in the near future. Note: My personal site will be adding additional information re: my volatility research and will be updating over the next few days. Google's dramatic decline on Friday was followed by two solid gains on Monday and Tuesday, leaving GOOG up over 10% thus far this week. That led me to ask the question: How good of a bellwether is GOOG when it is up or down sharply in the short-term? Going back to August, 2004 (N = 353), we find 30 days in which GOOG has shown a gain of over 5% in a two day period. Three days later, the S&P 500 Index (SPY) is up by an average .56% (20 up, 10 down). This is quite a bit better than the average two-day gain of .12% (206 up, 147 down) for the sample overall. I also found 21 days in which GOOG was down by 4% or more over a two-day period. Five days later, SPY was up by an average .96%, with an amazing 19 occasions up, 2 down. This is quite a bit better than the average five-day change of .20% (208 up, 145 down) for the sample overall. Interestingly, the near-term outlook is good for SPY when GOOG is very strong and when it's very weak. Score this one for the bulls with respect to the current market. (Note: Other factors lead me to be concerned about the present market's upside potential; I will outline those on my site tonight). When GOOG is strong, it means that the market's speculative sentiment is alive, and that carries over to near-term market trade. When GOOG sells off strongly, speculative froth is exiting the marketplace, and that puts in a short-term market bottom. Such may have been the case on Friday. Of course, all speculative leaders end up eventually becoming laggards, so these patterns can't continue forever. In this bull market so far, however, GOOG has been a worthy bellwether. Keep an eye on the Trading Markets site: I hope to extend the GOOG research in an article. I couldn't wait to add this to the blog. Check my personal site tomorrow for details. This is a measure of institutional presence in the market that updates every 20 seconds. It correlates with daily price range by .45 since the beginning of January. 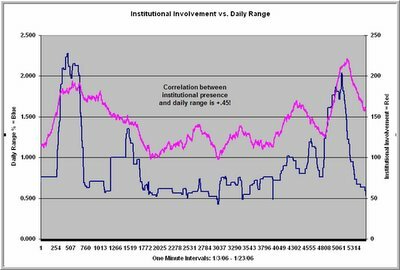 Now the question is whether institutional involvement during period X will predict volatility in period Y. Stay tuned...this is getting fun. I have received a number of email inquiries regarding indicators for assessing the likely volatility of the coming day's trade. I will post something to my personal site shortly on this topic. Obviously such information is invaluable on days such as Monday, when all indications from Friday pointed to likely volatility. When we saw the narrow overnight range, however, followed by mediocre volume in the ES, it became clear that this was not going to be a breakout day. Being able to evaluate volatility in real time is critical, because it enables you to handicap the odds of moves breaking through ranges vs. reversing back into the ranges. As we can see from the comparison of Friday and Monday, greater volume and volatility makes the difference between a day of breakouts and a range bound day. We followed Friday's large decline with a small gain amidst low volatility on Monday. As we saw from the previous posts, this is a statistically unusual event. When I went back to December, 1998 (N = 1793), I found how unusual this is. After a large decline of more than 1.5%, we have never--until Monday--had a rise on such low volatility. For what it's worth, small bounces from large declines that occurred on ranges of less than 1.5% (N = 8) were down the next day on six of those occasions for an average loss of -.94%. In general, lower volatility bounces tended to fare more poorly three days out than high volatility rises. While the numbers are too small for statistical significance, their bearish cast makes sense given that--thus far--the downside is attracting more interest than the upside and--in Market Profile terms--we are accepting value at progressively lower prices. Note: I recently submitted an article to Trading Markets regarding the recent downward volatile trade. That should appear Monday AM. Also see the last couple of entries on this site for a perspective on the week to come. Finally, Sunday evening's Trader Performance blog on my personal site will offer some psychological insight as to how to utilize the historical analyses offered herein. For my last analysis of Friday's sizable decline, I took a different approach. Going back to January, 2000 (N = 1518), I calculated the 200 day standard deviation of price changes and investigated what happens after the market moves more than 2 standard deviations lower in a single day. The beauty of this analysis is that it adjusts the investigation for changes in volatility over time, so that what is steep in a non-volatile market and in a volatile one is different. I found 34 such occasions and looked at what happens in SPY afterward. Two days after the steep drop, the market was up 23 times, down 11 for an average gain of .77%. This is much stronger than the average two-day gain of .00% for the sample overall (759 up, 759 down). Steep drops tend to be followed by rebounds in the near term. Buying weakness the day after the steep drop and holding for strength the following day was a profitable strategy overall. 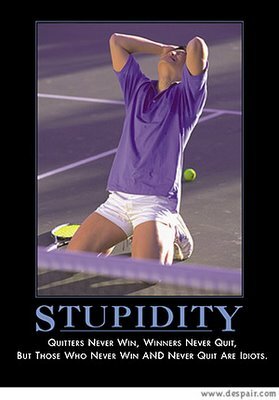 That having been said, the strategy was much less successful for much of 2001 and 2002 than for the rest of the sample. As we saw before, weakness in a bull market provides opportunity; in a bear market it often leads to a cascade of selling and a clustering of weak days. This clustering, such as we saw in July, 2002, is the reason why such weak market occasions must be followed by careful reading of subsequent real-time action. Although the odds are bullish following weak market days overall, when weakness does follow weakness, the downside can be substantial--especially given the enhanced volatility that such big down days engender. Since the bull market started in 2003, we have had 7 instances of weak market days that have fallen more than two standard deviations. The market has been up 5 times, down twice, for an average two-day gain of .85%. Once again, the response of the market to the latest weakness will provide a piece of information regarding whether we continue in the bull mode. I took a more detailed look at what happens after high volume large declines, and the findings are interesting. Since January, 1998 (N = 2021), I found 36 occasions in SPY in which we had a decline of greater than 1.5% on volume that exceeds the average 60 day daily volume by more than 75%. This fits Friday's trade well, where we declined by 1.82% on 105% of the average 60 day volume. From the close to the following day's open, the average loss was -.12% (18 up, 18 down), which is weaker than the average move to open of .04% (1104 up, 917 down). Nine of the 36 occasions moved more than 1% up or down from close to open, far more often than normally occurs. This is reflective of above average overnight volatility following the high volume decline. This above average volatility carries over to the next trading day as well. The average high to low range for the sample overall is 1.60%. For the day after the high volume down day, however, the average trading range has been 3.2%. Indeed, only 4 of the 36 occasions saw a high to low range of under 1.5%. Clearly this leads us to expect some volatile trade on Monday. In terms of directional edge, although the day after the weak high volume day tends to open weak, by the close this has typically turned around. Three days after the weak high volume day, the market is up by an average .54% (23 up, 13 down), much better than the average three-day gain of .06% (1091 up, 930 down). When we break this down historically, though, a pattern emerges: since 2001, the results following a weak high volume decline have been much worse than from 1998-2000. During the bull market of 1998-2000, weak high volume declines tended to be followed by gains; during the bear market, those same declines tended to cluster, creating multiple high volume declines and subnormal results. For instance, from 2001 - 2005, two days after the high volume large decline we averaged a drop of -.84% (6 up, 12 down), but from 1998 - 2000 we averaged a gain of 1.64% (15 up, 3 down)! Where does that leave us? The clearest finding from the data is that a high volume weak day tends to produce high volatility prior to the open (overnight session) and during the next day's trade. In a bull market, such declines become short-term opportunities to pick up bargains. In bear markets, such declines feed upon themselves, generating large price drops. How the market responds to Friday will tell us much about the kind of market we're in. I will be monitoring the measures of buying/selling from the Trading Psychology Weblog intraday to gauge whether we're seeing bargain hunting or panic selling. FWIW, since 2003, we've only had 3 days of large declines on high volume. The next day, the market has been down twice, up once. When we opened lower on those two occasions, we traded lower through the remainder of the day. When we opened higher, we traded modestly lower from open to close. I will need to see tangible evidence of buying before fishing for bargains in Monday's trade. Friday's market moved sharply lower, with SPY down 1.82% on volume that was 136% of its 20 day average volume. What typically happens after such a decline? I will provide a preliminary analysis here, but will follow up tomorrow with further analyses. I went all the way back to January, 1998 (N = 2022 trading days) and found only 29 days in SPY that were down more than 1.5% on volume that exceeded the 20 day average by more than 75%. Large, high volume declines have thus been rare--especially recently. During this low volatility bull market, we've only had one occurrence: 3/10/04. The market followed that down day with a further decline of 1.3% the next trading day. Over the next three trading days, when we've had a steep decline on large volume (N = 29), the market has been up 19 times, down 10 for an average gain of .83%. That is quite a bit better than the average three-day gain of .06% (1091 up, 931 down) for the sample overall. There is thus a tendency to rebound over the near term. Interestingly, the day after a high volume steep decline tends to be a big day, whether up or down. Of the 29 occurrences, 19 were either up or down the next day by more than a full percent, and 8 of the 29 moved more than 2%. This reflects serial volatility: highly volatile trading days tend to be followed by days that are above average in volatility. In fact, the average absolute one day change in the sample was .92%, but the absolute one day change following a high volume steep decline was 1.56%. I recently submitted an article to Trading Markets that looks at the relationship between the size of the overnight moves in the major indices and the trading range the next trading session. It turns out that for such averages as the S&P 500 Index (SPY), the NASDAQ 100 Index (QQQQ), and the Dow Jones Industrial Average (DIA), the correlation between the size of their move from close to open and the subsequent high-low range is in the order of .33. When the overnight move is greater than .50%, the market has a trading range that exceeds 1% over three-quarters of the time. When the overnight move is less than .05%, the market trades in a range greater than 1% less than half of the time. Interestingly, the Russell 2000 correlation is only about half that of the Dow. Overnight events may well impact large cap issues more than small caps. It is also interesting to look at correlations for individual stocks. Many stocks, such as MSFT (.30), AAPL (.27), and IBM (.23) have correlations similar to the indices. Others, such as XOM (.07) show little relationship between the magnitude of overnight moves and trading range the next day. 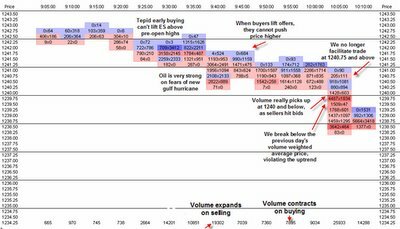 This may be because XOM is impacted more by contemporaneous movement in the oil market than by overnight events. Using overnight movement and current volume to predict near-term volatility has been extremely helpful in my trading, as volatility is a predictor of whether markets will break out of ranges vs. revert to mean trading prices. This appears to be a strategy that can work for individual equities as well as indices. Wednesday's market opened down, but was up from open to close. Since January, 2004 (N = 514), we've had 52 occasions in which the market (SPY) opened lower by .3% or more. The next day, the market was up by an average of .02% (31 up, 21 down)--no real edge relative to the average change of .03% (283 up, 231 down) for the sample overall. When we use a median split to divide the days that opened down by whether they were strong vs. weak from open to close, a pattern emerges. When the market was strong from open to close after a down open (N = 26), the next day averaged a loss of -.20% (12 up, 14 down). When the market was weak from open to close after a down open (N = 26), the next day averaged a gain of .23% (19 up, 7 down). Interestingly, strength during the day after a weak open has not carried over to the next day. Indeed, more often than not, such strength has been reversed. Today's market gapped lower at the open and closed lower. Now it appears likely that we'll gap lower tomorrow AM on the NASDAQ 100 Index (QQQQ), given the weak Intel news. What has happened during the trading day after we've gapped lower two days in a row? Since January, 2003 (N = 765), we've only had 1o occasions in which a day that has closed lower and gapped down at the open has been followed by a second gap down. From the open of the market that second day (which would correspond to Wednesday in current trade) to the close, the market averaged a loss of -.74% (2 up, 8 down). That's quite a bit more bearish than the average open to close change of .01% (393 up, 373 down) for the sample overall. In short, despite the market's tendency to reverse weakness in the short run, two consecutive gaps down have not, on average, led to a rebound during the subsequent trading day. Although it might be tempting to jump into the market at the open and look for bargains, on average this has not been a winning strategy since 2003. As we found earlier, bond and stock prices have been positively correlated over longer time frames in the market (40 days) since 2003, but not on a day-to-day basis. We saw with day-to-day results, strong bonds and strong stocks led to subnormal returns; weak bonds and weak stocks led to above average returns. Now we'll look at stocks and bonds over a 40-day basis. Specifically, we want to see if strong bonds over a 40 day period are associated with strong stocks over the next 40 days. Since March, 2003 (N = 686), 40-day periods have had a distinctly positive bias. The S&P 500 Index has averaged a gain of 2.33% (483 periods up, 203 down) during that time. When we conduct a median split of the data based on 40-day bond strength, we find that strong bonds yield an average gain of 3.30% in SPX over the next 40 days (260 up, 83 down). When bonds are weak, the next 40 days in SPX average 1.35% (223 up, 120 down). What we're seeing is a very different pattern in the short-term and longer-term data. For intermediate-term traders and for investors, bond strength is bullish for stocks. For short-term traders, bond strength has been bearish for stocks. Knowing one's time frame and price patterns typical of one's price frame is all-important. Yesterday's entry looked at strong days in the stocks since 2003 and found a tendency for near-term reversal, especially when bonds were also strong. That made me curious about weak days in stocks (SPX). Is the outlook following weakness different as a function of bond prices? Since January, 2003 (N = 760), we've had 185 days in which SPX has been down by half a percent or more. The next day, stocks have risen on average .12% (112 up, 73 down), which is considerably stronger than the average rise of .03% for the remainder of the sample (310 up, 265 down). This is the pattern of strength following weakness that we've encountered before. Once again I subjected the weak SPX days to a median split based upon bond price performance that day. When bonds were weak and stocks were weak (N = 93), the next day in stocks averaged a gain of .26% (62 up, 31 down). When bonds were strong and stocks were weak (N = 92), the next day in stocks averaged a loss of -.02% (50 up, 42 down). Again, this is counterintuitive. You would think that falling stocks and rising interest rates (falling bond prices) would yield weak stocks going forward. Just the opposite is the case: when stocks have been strong and bonds strong, we've had subnormal short-term returns going forward. When stocks have been weak and bonds weak, we've had above average short-term returns. These patterns will be worth following, especially given the recent divergence between stocks (which have made new highs) and bonds (which have not). Strong Stocks: Do Bonds Make a Difference? Today's entry on the Trading Psychology Weblog mentioned an interesting relationship between bonds and stocks from 2003 to the present. 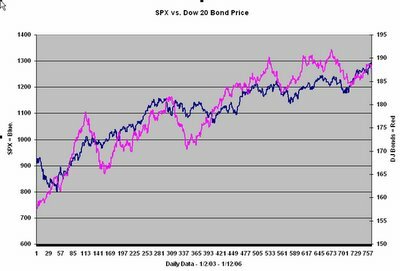 Of the twenty days that were strongest in stocks (SPX), sixteen of those exhibited declining bond prices. Of the twenty weakest days in stocks, thirteen showed rising bond prices. It appears to be a kind of flight from/to quality phenomenon: When stocks drop, money goes into fixed income and vice versa. This led me to wonder if we might see different expectations when strong and weak days in stocks are accompanied by strength or weakness among bonds. Since 2003 (N = 760), we had 195 days in which SPX was up by .50% or more. The next two days, the market averaged a loss of -.10% (96 up; 99 down), much worse than the .17% average gain (311 up, 254 down) in the rest of the sample. This is the weakness following strength pattern that we've noticed before. Now, however, let's conduct a median split and compare strong SPX/strong bond days to strong SPX/weak bond days. After the strong SPX/strong bond days (N = 98), the market averaged a two-day loss of -.23% (46 up, 52 down). After the strong SPX/weak bond days (N = 97), the market averaged a two-day gain of .02% (50 up, 47 down). Interestingly, days in which both stocks and bonds are strong have been followed by noteworthy two-day weakness. To the extent that fixed income might serve as an alternative to stocks, a rally in both stocks and bonds would represent general optimism regarding financial assets and a putting of money to work in those sectors. When stocks are strong but bonds weak, we might be seeing a mere transfer of assets within the universe of financial instruments. When traders are overly optimistic about the financials, stocks have tended to correct over the short term. Ironically, a market rally on lower interest rates--a seemingly positive development--has led to subnormal returns near term. Tomorrow I'll look at SPX weakness vis a vis bonds. A reader suggested to me that I take a multidimensional approach to historical patterns and investigate intermarket relationships such as between bonds and stocks. This is an excellent suggestion, and it highlights the need to look at many patterns before jumping in and trading any single one. An approach I like to take is to look at non-overlapping patterns (such as between daily SP and bonds, daily SP and advance-decline, and weekly SP and volume) and see if there is a consensus among the "committee of experts". Some excellent trade ideas emerge when you see a pattern edge from multiple patterns. The bond/stock relationship is a complicated one. As we can see from the chart above, which covers 2003 - present, the price of the DJ corporate bonds is highly correlated with the price of the S&P 500 Index. When we look on a day to day basis, however, the correlation is -.12! A strong or weak day in bonds tells us very little about whether that day was strong or weak in stocks. Over a period of 40 days, however, the correlation is .38--positive and significant. Note that dips in bond price have been excellent points to purchase stocks. But note also that the current price highs are the first ones since 2003 to go unconfirmed by the bonds. To the extent that bonds lead stocks, there might be a message there. I will investigate this further and post tomorrow. I just submitted an article to Trading Markets that should appear tomorrow. It takes a look at occasions since March, 2003 when we've had 1400+ new 65-day highs. Monday was our most recent occasion with over 1400 new 65-day highs, so the analysis has some current relevance. Specifically, I looked at what happens within a 10 days period following the surge in new highs: the maximum gain, maximum loss, and average price change. Interestingly, half of the occasions (N = 26) occurred early in the bull market; half came later. The early occasions led to significant strength over the next ten days, with an average gain of 1.77% (10 up, 3 down). The later occasions were underperformers, with an average gain of .11% (7 up, 6 down). For the entire data sample (N = 703), the average ten-day price change was .63% (437 up, 265 down, 1 unchanged). My speculation is that there is a developmental course to bull markets. Early on, strength begets strength during the swiftest portion of the market's ascent. As the rate of change slows and the market tops out later in the bull period, strength begets subnormal performance. My data suggest that the recent periods of market strength have not led to above average market declines. Rather, they've been followed by subnormal strength. How we follow up the early strength in 2006 may say quite a bit about the relative youth vs. aging of this bull market. BTW, the new high/low data and a very broad measure of market momentum called Demand/Supply are published daily on my personal site. The QQQQ (NASDAQ 100 Index) has been up for seven consecutive sessions for a total gain of 6.9%. Moreover, each of the seven days has closed nearer to its high than to its low for the day. I went back to March, 2003 (N = 703) to see what happens after such a period of strength. For the sample overall, the next seven days average a gain of .58% (406 up, 297 down). For the 47 occasions in which QQQQ has risen more than 5% over a seven-day period, the next seven days have averaged a gain of .43% (29 up, 18 down). Clearly, seven-day strength in QQQQ has not provided a bullish edge over the next seven days; nor has it been bearish. I then looked at seven-day strong periods in QQQQ where six or more of the days closed closer to their highs than to their lows (N = 22). The next seven days averaged a gain of .28% (14 up, 8 down). Interestingly, we've only had six occasions in which all seven days during a strong period closed strong; the next seven days averaged a loss of -1.62% (3 up, 4 down). In short, seven day strength in QQQQ has not given us further upside momentum over the next seven days. Indeed, the strongest closing seven day periods have had somewhat weaker results over the next seven days compared to the periods with fewer days closing strong. Tuesday's market opened lower, but closed higher by almost .40% on SPY. Going back to January, 2003 (N = 761), we have 122 occasions in which the market has opened lower but rose more than .3% from open to close. Although this would seem to indicate market strength, there is no distinct edge going forward. Indeed, the reversal days slightly underperformed other days with respect to next day performance. After the reversal days, the market was down by -.06% (60 up, 62 down) the next day. The remainder of the days in the sample were up by the next day by an average .07% (363 up, 276 down). It will be interesting to test longer-term reversal patterns to see if they sport any advantage. Intermediate-term new highs were very strong on Friday, with 2132 new 20-day highs and 1231 new 65-day highs. Since January, 2003 (N = 743), we've had 30 days where new 20-day highs were greater than 2000 and new 65-day highs were above 1000. Three days later in SPY, the market was up 15 times, down 15 for an average loss of .00%. This compares unfavorably with the average gain of .15% (421 up, 292 down) for the remainder of the sample. This relative weakness is not present 10 days out. In short, after very broad strength, the market more often than not has consolidated over the next three days before resuming its upward course. So far, we've seen momentum effects over the long-term (1000-day periods) and intermediate term (10-day), in which strength begets further strength. Interestingly, however, that pattern does not apply to a day-by-day market analysis. Going back to January, 2003 (N = 759), I found 302 days in which SPY closed higher than the day previous and made a higher price high. The following day, the market's high averaged .49% above its previous day's close and averaged .00% from the previous close to the following day's close. This is weaker than the average .59% from close to next day's high for the sample overall and the average gain of .05% day over day. When I conducted median splits, the strength of the day's rise had no significant impact on the strength of the next trading day. Indeed, strong days--if anything--tend to invite profit taking, not follow through strength. This is but one more example of where it's tempting to generalize patterns from one time frame to another--but perilous to do so. Yesterday's post found momentum effects with respect to multi-year highs. When we make longer-term highs in a strongly rising market, expectations for gains going forward are better than when we make longer-term highs in a modest uptrend. I decided to explore this as a general pattern by seeing what happens after we make 10-day highs, as was the case Friday. Interestingly, although the market has seemed strong over the past ten days, it is below the average gain of 2.52% that we have normally seen during 10-day highs since 2003. Looking at SPY since January, 2003 (N = 750), we find that 176 instances of ten-day highs. Three days later, the market is up by an average of .01% (94 up, 82 down), worse than the average three-day gain of .14% (437 up, 313 down) for the sample overall. A median split of the 10-day highs, however, once again shows a momentum effect. When the new highs are made in a strong market, the next three days average a gain of .10% (54 up, 34 down), but when new highs are made in a weaker market, the next three days average a loss of -.08% (40 up, 48 down). This suggests that the present market does not have an edge relative to historical averages with respect to the next three days and may even be at a disadvantage. Markets that make 10 day highs but show 10-day rates of change of less than 2% have underperformed those that make 10 day highs with stronger momentum. We've been hearing so much about the Dow and other stock indices making multi-year highs that I decided to take a longer look and see what happens after we make a 1000 day high in the Dow. This roughly corresponds to a 3-4 year price high. I went back to July, 1952 (N = 13362) and found 889 occasions of 1000-day highs. Eighty days later, the Dow was up by an average of 3.13% (633 up, 256 down), somewhat more favorable than the average eighty-day gain for the sample: 2.56% (8535 up, 4827 down). Interestingly, however, when we look at how much the Dow has actually risen during the 1000 day period in which it made new price highs, the forecast for the next eighty days is impacted greatly. When the Dow has risen less than 30% over the 1000-day period (as is the case at present; N = 64), the next eighty days average a gain of only .69% (39 up, 25 down). When the Dow has risen more than 30% over the 1000-day period, the next eighty days average a gain of 3.32% (594 up, 231 down). In general, the stronger the Dow's performance over the 1000-day period, the more favorable the outlook for the next 80 days. When the Dow makes a 1000 day high, but is up only modestly in that period, the next 80 days actually underperform the long-term historical norm. Three Strong Days in QQQQ: What Next? The NASDAQ market (QQQQ) has been up approximately 3.74% in the past three days. Since January, 2003 (N = 756), we've had 62 occasions in which QQQQ has risen more than 3% in a three-day period. Three days later, the market is up by an average of .41% (41 up, 21 down), better than the average gain of .21% (407 up, 349 down) for the sample overall. Moreover, the strength following a strong three-day period tends to be greater when the prior three days have been up on above average volume. For example, when the market is up over 3% over a three-day period on above average volume (N = 31) based on a median split, the next three days are up by an average of .48% (22 up, 9 down). Note that Friday will be an unusual day due to the big unemployment number coming out in the morning, so generalizing from the past is more chancy than usual. Nonetheless, we've had solid strength on solid volume over three days and--all else being equal--that leads to residual strength over the next three days. Tuesday was a strong day and, as our analysis suggested, Wednesday followed through to the upside. One notable aspect of Tuesday's strength was a very high Demand/Supply ratio, as mentioned on the Trading Psychology Weblog. I went back to January, 2003 in SPY (N = 749) and investigated occasions when the following occurred: 1) the market was up strong (> 1%) with a strong Demand reading (> 140) and 2) the following day was up. The 14 occasions that met these criteria (matching the current market) were up 6 times, down 8 the next day, for an average gain of .18%. Three days out, however, they were up 9 times, down 5 for an average gain of .66%. While this offers no directional edge to tomorrow's trade, it does suggest continued upside potential in the short run thereafter. Strong Up Day: What Next? We rose strongly on Tuesday after dipping well below the day's open. Since January, 2003 (N = 752), we've had 26 days where SPY has risen more than 1.5%. The next day, the market has been up 17 times, down 9 for an average gain of .15%. This compares favorably with the average daily gain of .05% (416 up, 336 down) for the sample overall. Strong days that occur after an initial move down below the day's open tend to carry the next day strength over to the next several days. Strong days that occur after a five day period of weakness and that occur on above average volume also tend to follow through better. For all these reasons, Tuesday's strength has set up expectations of strength for the remainder of the week. In fact, when the previous five days have been down more than1% and the most recent day is up more than 1.5% (N = 11), the next day is up 9 times, down twice for an average gain of .63%. This is an example of high strength tending to follow through in the short run--a pattern that sustained the upturn through Tuesday afternoon. I've received a number of emails regarding the use of the Market Delta program in trading, so I decided to post here rather than answer the same questions separately. For those not familiar with MD, it displays price in a bar chart but within the bar captures volume information. This includes total volume at each time and price and a division of the volume in terms of the number of contracts (or shares) traded at the bid price vs. the number traded at the offer. The chart above is taken from Market Delta; I have annotated it to show areas where you can see buying dry up and selling picking up. This is very helpful information for short-term traders. The key is looking at the bars horizontally as well as vertically. When there's buying, for instance (buyers eager to get into the market and lifting offers), you can see increasing volume with higher price when you look vertically. You can also see increasing volume at each price relative to the previous bar when you look horizontally. Markets that are facilitating trade will show increasing horizontal and vertical volume. It's when volume peters out, both horizontally and vertically, that you start to look for short-term reversals. When you combine the information from MD with the Market Profile, you can gain a very good understanding of the day's auction dynamics. You'll see volume pick up at range extremes prior to breakouts, and you'll see volume die out prior to mean reversions. Many good trade ideas can be developed from this combination of sources. Another use for MD is looking at occasions when large traders are entering the market and seeing whether their big trades are predominantly at the bid or offer. Large traders will control market direction in the short-run; knowing whether they're leaning long or short is very useful information. Setting MD to a 1 tick reversal bar will basically show you every trade coming into the market and whether it's at bid or offer. Or you can just watch the shifts of volume within longer-term bars to see size coming in. This article I wrote a while back explains why I think information re: large traders is important. Several people have asked me about settings for bar coloration in MD. It's not crucial; just create a setting that gives you the darkest color (indicating highest selling or buying volumes) about a third of the time. That way, you'll know that volume is about 1 standard deviation above normal when you see the dark colors. Otherwise, color is much less important than the shifts of the numbers, vertically and horizontally. Please note that I do not have a proprietary interest in MD, Market Profile, or any other programs I mention on my sites. I do keep my eyes open for unique implementations of trading software and try to bring this to readers' attention from time to time. Later this week I hope to talk with the founder of Ninja Trader and pass along some impressions of that program. I will resume the historical analyses of the market after Tuesday's trade. In the interim, check out my coming article in Trading Markets on turning around trading slumps and my recent and coming entries in the Trader Performance section of my personal site.